Happy Thursday! 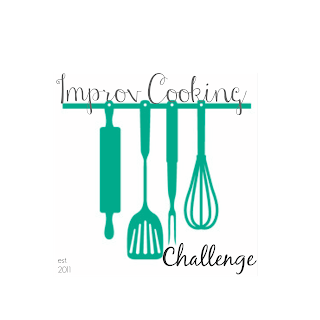 Late last month the participants of the Improv Cooking Challenge and I decided to make a change to our posting date. Many other blogging events occur on the third Thursday of the month, so we voted and decided to move up our posting date by one week. Now you’ll be able to check out the awesome recipes one week earlier! The ingredients for this month were cookies and cream. I decided to go pretty classic with this and make a cake I knew my coworkers would enjoy. While there are tons of cake recipes out there that are perfectly sculpted, evenly frosted and very pretty to look at, I simply don’t have that talent. 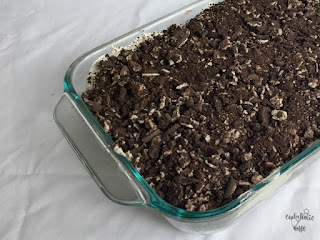 So, insert the poke cake – A simple cake made in a 9×13 baking dish, has holes poked into it and then is covered with a sweet concoction, like sweetened condensed milk. A super moist cake, this chocolate cake is covered in sweetened condensed milk and then topped with crushed Oreo cookies. 2. Pour the entire can of sweetened condensed milk over the cake. 3. Whisk together the cookies and cream pudding mix and whipped topping until combined. Spread in an even layer on top of the cake. 4. Sprinkle crushed cookies in an even layer on top. 5. Cover and refrigerate for at least an hour but up to overnight before slicing and serving. Leftovers can be kept in the fridge. I used unsweetened almond milk in this recipe in place of regular milk because it was what we had in the fridge. I realized a little too late that the super common wooden spoons with tiny ends that nearly everyone on earth has in the kitchen, I don’t possess, so I ended up using a massive wooden spatula end. After nearly all of the holes were poked, I realized a simple plastic straw (which I have hundreds of) would have worked much better, hence the note in the recipe. Simple creations are often the best Nichole. Thanks for hosting and thanks for changing the days. I love a good poke cake, and now I have another idea for one I can make for the Legion Cake raffle. I make and donate a cake every couple of weeks for that. It's one way for me to feed my baking addiction without having to eat all that cake. This looks amazing…I've never had much luck with poke cakes myself. I think I'm always afraid of poking too many holes or making the holes too big. That doesn't seem to be problem here seeing as you can cover up all the holes with cookies. Poke cakes are the best! I can still remember the taste of the first one I ever had — YUM!